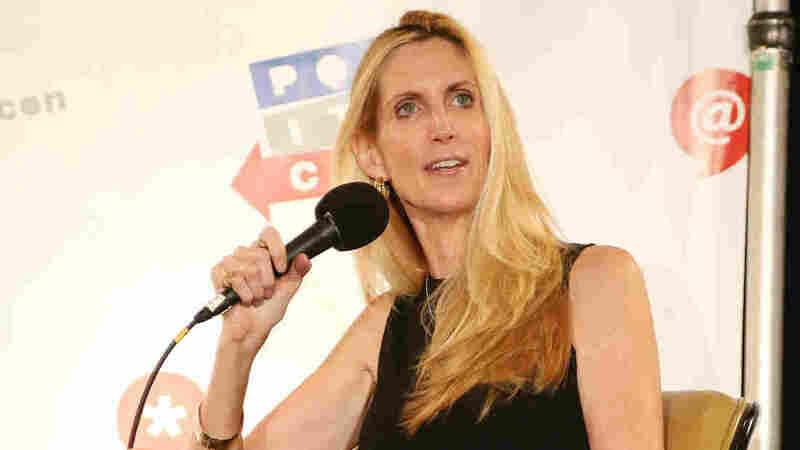 UC Berkeley Changes Course And Offers To Host Ann Coulter Speech : The Two-Way UC Berkeley, the home of the Free Speech Movement, is embroiled in another controversy testing that campus' legacy. It invited, then disinvited, then reinvited a conservative pundit. Ann Coulter speaks during Politicon in Los Angeles in 2015. Chancellor Nicholas B. Dirks said in a news conference Thursday that campus police "have very specific intelligence regarding threats that could pose a grave danger to the speaker, attendees and those who wish to lawfully protest the event." Dirks said that's the reason why he had instructed his staff to find "an appropriate, protectable" space. He said the exact location will be disclosed later. In a tweet, Coulter rejected the offer writing, "I'm speaking at Berkeley on April 27th, as I was invited to do and have a contract to do." She added that Berkeley has added "new, more burdensome conditions on my const rts." The controversy comes after the UC campus and the city of Berkeley itself have seen three high profile incidents of political violence in recent months. On March 4 and April 15, left and right wing protestors skirmished in a nearby Berkeley park. In February, masked agitators, commonly known as Black Bloc, broke windows and set fires at the campus building preventing right-wing provocateur Milo Yiannopoulos from speaking. On Wednesday, UC officials initially cancelled Coulter's planned speech for April 27 and she and her supporters immediately promised that she would appear on campus nevertheless. Early Wednesday, UC Berkeley Vice Chancellor Scott Biddy and Vice Chancellor for Student Affairs Stephen Sutton emailed a message to organizers that "given currently active security threats, it is not possible to assure that the event could be held successfully." The administrators wrote that they "have been unable to find a safe and suitable venue" based on the university police department's safety assessment. He said he was "extremely disappointed" by the university's initial decision. UC Berkeley officials said that Coulter's insistence that she will come to Berkeley was "a game changer," according to campus spokesman Dan Mogulof. "We want this event to take place," said Mogulof. "We look forward to working with them on what we hope will be a safe and successful event." "There wasn't a viable space for April 27th," said Vice Chancellor Stephen Sutton. "So we've looked at some spaces in the first week of May that give us more flexibility in terms of being able to host the event." The planned Ann Coulter speech was a collaboration among YAF, the Berkeley College Republicans and BridgeUSA, formerly known as BridgeCal. BridgeUSA is a nonpartisan organization that aims to "create a dialogue" and challenge people with "opinions you disagree with," says Jandhyala, the founder and president. Coulter had planned to speak on the issue of immigration. Jandhyala defended Coulter's invitation, saying it helps create a "conversation on this issue of illegal immigration that needs to happen." BridgeUSA has invited speakers of different political persuasions to campus, including a recent discussion with former Clinton White House staffer Maria Echaveste. Jandhyala says the majority of Coulter's speaking fee, $17,000, was being paid by YAF, with $3,000 being paid by BridgeUSA. The conservative Coulter, who frequently attacks liberals, was bound to draw ire at the notably liberal college campus. She's the author of several books, including Adios, America; In Trump We Trust; and Never Trust a Liberal Over 3 — Especially a Republican.